For many centuries, scientists have debated the cause and best treatment of the disease now known as malaria. Two theories regarding malaria transmission – that of “bad air” and that of insect vectors – have been widely accepted at different times throughout history. Treatments and cures have varied accordingly over time. This paper traces the evolution of scientific consensus on malaria aetiology, transmission, and treatment from ancient times to the present day. There are certain diseases which have been historically shrouded in mystery, their causes attributed to magical or spiritual forces. Ovarian teratoma, for example, a tumour named after the Greek τέρας (monster), is a neoplasm composed of hair, teeth, skin and other mature tissues. Aristotle attributed teratomas to hair that had been swallowed by the patient and deposited in various body tissues. But other theorists claimed more ominous origins: teratomas were variously reported to be a consequence of sexual relations with the devil, an expression of a nightmare (incubus), evidence of engagement in witchcraft, or a punishment for wickedness. Malaria has long been a member of this fascinating group of diseases with veiled origins. For many centuries it was believed that certain diseases, such as malaria and cholera, were caused by miasma (μíασμα, ancient Greek: pollution, defilement), a poisonous vapour or mist filled with particles from decomposed matter (miasmata). Prior to the introduction of the microscope, everything floating above ground that was invisible to the human eye, including dust particles and bacteria, was called “air” – so in a sense, perhaps this early aetiological speculation was not far from the truth. This disease is habitual to them both in summer and in winter, and in addition they are very subject to dropsies of a most fatal character; and in summer dysenteries, diarrhoeas, and protracted quartan fevers frequently seize them, and these diseases when prolonged dispose such constitutions to dropsies, and thus prove fatal. 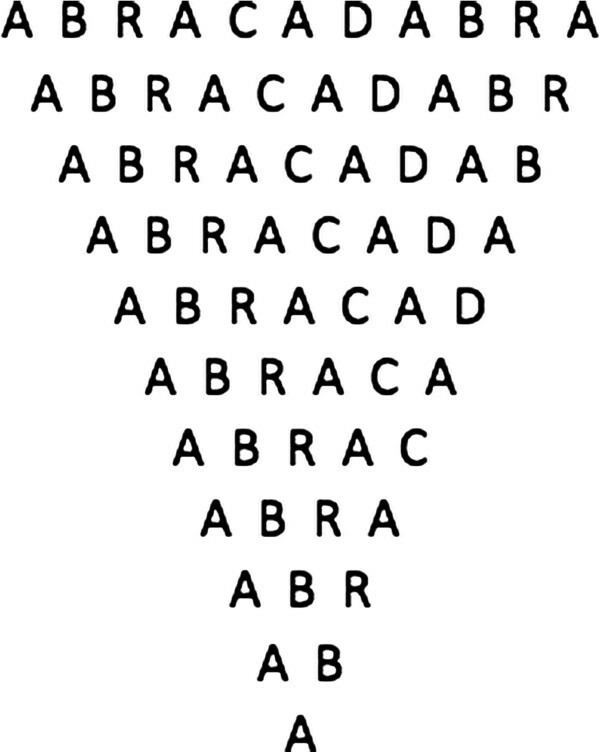 Write several times on a piece of paper the word ‘Abracadabra,’ and repeat the word in the lines below, but take away letters from the complete word and let the letters fall away one at a time in each succeeding line. Take these away ever, but keep the rest until the writing is reduced to a narrow cone. Remember to tie these papers with flax and bind them round the neck. After wearing the talisman for nine days, it was to be thrown over the shoulder into an eastward-running stream. Failing this treatment, Sammonicus recommended the application of lion’s fat, or the wearing of cat’s skin tied with yellow coral and green emeralds around the neck . Some scholars dismiss the word abracadabra as meaningless. Others, however, translate it as, “let the thing be destroyed”, “Out, bad spirit, out” (from the Hebrew words Abrai seda brai), or “Father, Holy Ghost, Word” (from the Hebrew words Ab, Ruach, Dabar) [3, 4]. The “bad air” or miasma theory of malaria aetiology remained an accepted hypothesis well into the 19th Century CE, when mosquitoes were found to be the transmitting agent of the disease. However, the correlation between disease and insects has its roots in antiquity. On the pyramid it is declared in Egyptian writing how much was spent on radishes and onions and leeks for the workmen, and if I rightly remember that which the interpreter said in reading to me this inscription, a sum of 1,600 talents of silver was spent. The ancient Hebrew word, עָרוֹב , often translated simply as “flies”, most likely represents a multitude of various sorts of insects – not only flies, but gnats, wasps, and hornets – of a more pernicious nature than their common counterparts. Advertendum etiam, siqua erunt loca palustria, et propter easdem causas, et quod crescunt animalia quaedam minuta, quae non possunt oculi consequi, et per aera intus in corpus per os ac nares perveniunt atque efficiunt difficilis morbos. Fundanius, Quid potero, inquit, facere, si istius modi mi fundus hereditati obvenerit, quo minus pestilentia noceat? Istuc vel ego possum respondere, inquit Agrius; vendas, quot assibus possis, aut si nequeas, relinquas. Precautions must also be taken in the neighbourhood of swamps, both for the reasons given, and because there are bred certain minute creatures which cannot be seen by the eyes, which float in the air and enter the body through the mouth and nose and there cause serious diseases. “What can I do”, asked Fundanius, “to prevent disease if I should inherit a farm of that kind?” “Even I can answer that question”, replied Agrius; “sell it for the highest cash price; or if you can't sell it, abandon it”. Recepto Florentini castello munitissimo praesidioque imposito, quid iam agendum foret consultabant. Erant quibus optimum videretur exercitum reducere, praesertim morbis gravitateque coeli laborantem , et longa difficilique militia per aestatis autumnique ferventissimos ardores insalubribus locis confectum, missione etiam multorum a duce concessa diminutum: nam postquam diutius in his locis commoratum est, multi, vel tedio castrorum vel metu valetudinis adversae, commeatum a duce postulaverant. Avuto i Fiorentini questo fortissimo castello e fornitolo di buone guardie, consigliavano fra loro medesimi fosse da fare. Erano alcuni a' quali pareva sommamente utile e necessario a ridurre lo esercito, e massimamente essendo affaticato per la infermità e per la mala aria e per lungo e difficile campeggiare nel tempo dell'autunno e in luoghi infermi, e vedendo ancora ch'egli era diminuito assai per la licenza conceduta a molti pel capitano di potersi partire: perocchè, nel tempo che eglino erano stati lungamente a quello assedio, molti, o per disagio del campo o per paura d'infermità, avevano domandato e ottenuto licenza da lui. The Italian term “mal'aria” (bad air) was introduced into England 300 years later by Horace Walpole in a letter he wrote on 5 July, 1740: “There is a horrid thing called the malaria, that comes to Rome every summer, and kills one.”. John MacCulloch introduced the word into the English scientific literature in 1827 . However, Charles Laveran, the first to see the malarial organism in blood in 1893, intensely disliked the name malaria. He considered the term unscientific and vulgar, preferring the name “paludisme” (Latin: palus = swamp) which is still used in France today . Currently, the use of the word malaria is restricted to the disease and its symptoms (and not its causative agent). Perhaps in part due to the name of the disease, the aetiological concept of bad air prevailed until the latter part of the 19th Century. During his many travels, the journalist and African explorer Henry Morton Stanley (1857–1932) erected a glass screen on his boat, which he used for his trips on the Congo River, as protection against miasma . Appointed as physician to three Popes (Innocent XI, Innocent XII and Clement XI), Joannes Lancisius was one of the greatest physicians of his time. In his book De noxiis paludum effluviis, eorumque remediis (“On the noxious emanations of swamps, and their remedies”), he describes the transfer of deadly diseases by animals, noting that “Venenata animalia non occidunt vulnere, sed infuso per vulnus venetico liquido” (Venomous animals do not kill by injuries, but they inject a poisonous liquid through the wound) . Lancisius strongly advocated the use of Cortex Peruvianus (Peruvian bark) for the treatment of periodic fever. Extracts of this bark had been used to treat malarial fever since the early 1600 s. However, the use of fine powder of Peruvian bark, mixed into French wine, was not without problems, and many physicians were not in favour of the use of the bark. In 1707, Anthony van Leeuwenhoek wrote to Heer van Wikhuysen, “This medicine is not to be used but with the utmost caution, for that otherwise it may be so prejudicial to the body, that tho the fever should be removed, the subsequent inconveniences may be worse than the disease itself''. Neither of the eminent Italian physicians Giovanni Lancisi nor Francesco Torti used the term malaria. It remained a term used exclusively in Italian folk medicine. In 1756, Francesco Torti defined a new standard of care for the use of Peruvian bark. 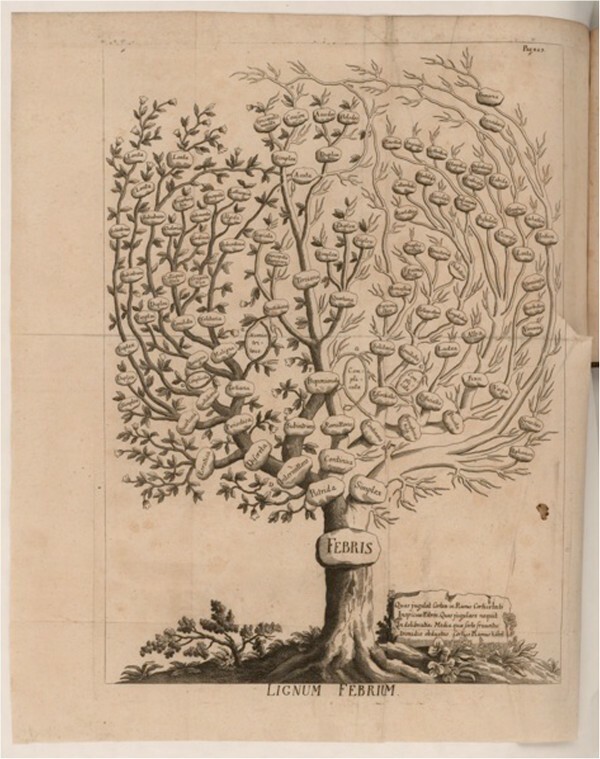 Using a drawing of the Lignum Febrium tree, Torti used bark-covered branches to represent conditions for which cinchona was effective. Barkless, leafless branches were used to represent conditions for which cinchona was ineffective (Figure 2). His elegantly illustrated publication showed that only intermittent fevers were responsive to treatment with cinchona bark . Torti Fever tree in the shape of a stylized cinchona plant. (Courtesy The John Carter Brown Library at Brown University). Malaria has long been distinguished from other fevers in two aspects. First, malaria is associated with a unique and characteristic periodic fever, and second, only malaria is curable by quinine. In 1735, Swedish botanist Carl Linnæus travelled to the University of Harderwijk in Holland where he earned his medical degree. His graduate thesis was entitled, “Inaugural thesis in medicine, in which a new hypothesis on the cause of intermittent fevers is presented. By the favour of God, three times the best and the greatest, submitted by Carolus Linnæus from Småland, Sweden, a Wredian scholar” . The drug quinine is extracted from the bark of a tree now known as the Cinchona tree . In 1742, Linnæus named the genus of this tree in his seminal textbook Genera Plantarum. In the second revised and enlarged edition, 1,021 plant genera were listed, including, as the last entry, the newly described Cinchona genus (Figure 3). 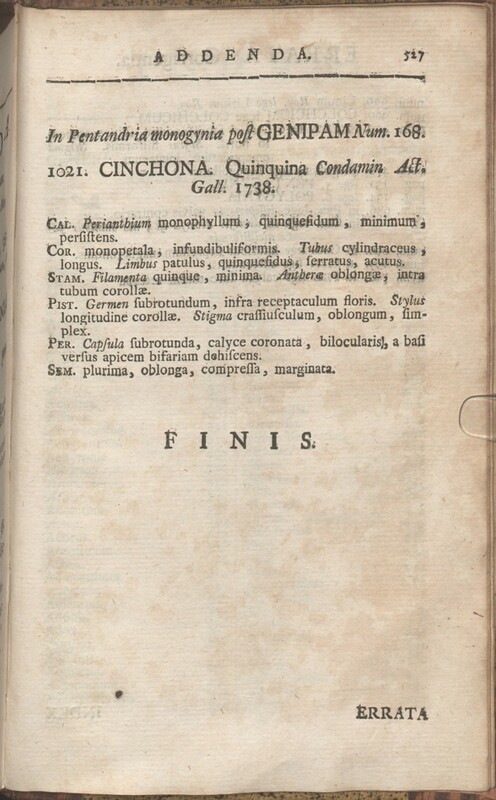 Linnæus’ listing of the Cinchona genus. 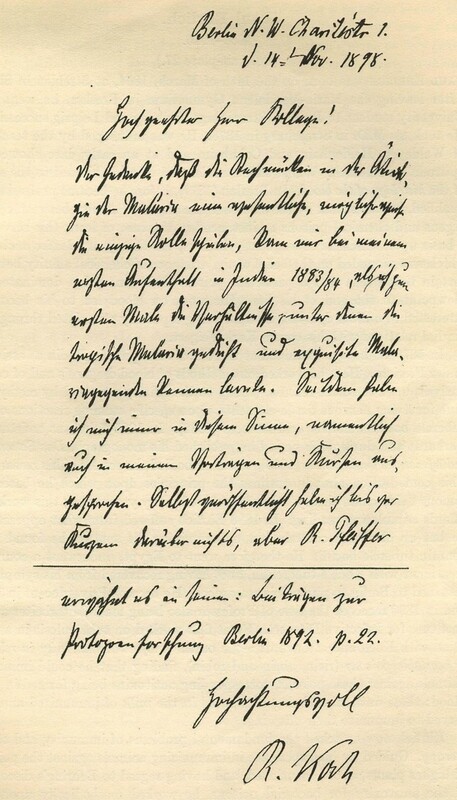 (Courtesy Bayerische Staatsbibliothek, München). In 1851, in his address to the Medical Society of North Carolina, Charles E Johnson refuted the doctrine of the miasmatic origin of malaria. As evidence, he pointed to the “sickly” constitution of the residents of Gibraltar, a town built on a bed of dry red sand with no ponds or marshes to furnish the decomposing vegetable matter necessary for the generation of miasma. In addition, he noted that no chemical analysis or microscopic investigation had ever been able to identify miasma, and that air composition was always found to be 78 parts nitrogen, 21 parts oxygen, and one part carbonic acid . Few families have had such an impact on medicine as the Meckel family, which for four generations contributed greatly to anatomy, pathology and the biological sciences. The last member of the Meckel lineage, Johann Heinrich Meckel (1821–1856), took the instructor’s position in pathologic anatomy at the University of Berlin that his great-grandfather had held at the Charité. After his untimely death from pulmonary disease, Meckel’s position was filled by Rudolf Virchow . In the 1800s, malaria was endemic in all of Central Europe, except Lichtenstein. It was well known that patients who died of malaria had black deposits in their organs. According to Hippocrates, these black deposits were characteristic of malaria, and were attributable to bile. This view prevailed until Johann Meckel proved otherwise. In 1846, a patient named Adelheid B died at the age of 43 after 24 years in various hospitals for mentally ill patients. Malaria had not been diagnosed prior to her death. Heinrich Meckel conducted her autopsy. He found her brain to be dark brown, with all capillaries filled with brownish particles which were without Brownian motion. The spleen was enlarged and likewise dark brown, with similarly filled capillaries. Meckel concluded that the brown pigment was a blood product (“aus dem Blutroth entsteht ein schwarzes Pigment”) . Meckel did not associate the pigment with malaria. 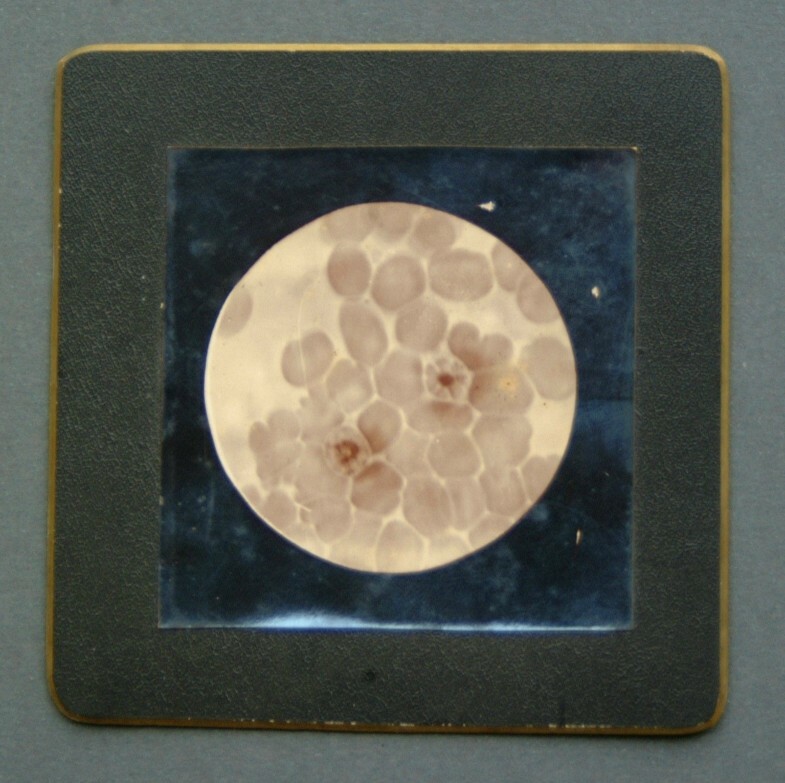 But only a few years later the causal relationship of this brown pigment to malaria was established by Virchow and Frerichs, and malaria was recognized to be a disease of the blood (Figure 4) [22, 23]. Meckel had erroneously assumed the pigment was chemically identical to melanin, but Virchow correctly associated the pigment with haematin crystals (“aus Hämatin condensiert sich allmählich körniges oder krystallinisches Pigment”). 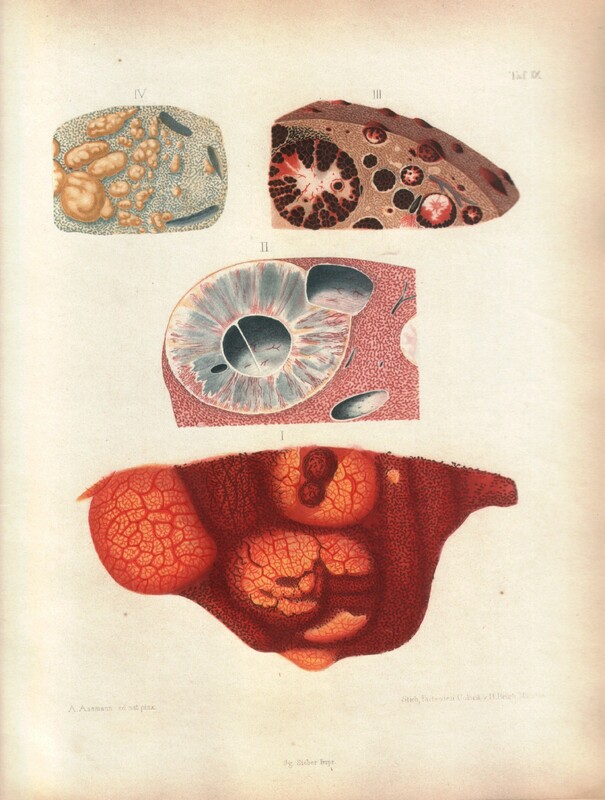 Frerichs’ drawings of the deposition of pigment in internal organs of intermittens patients. (Courtesy Staatsbibliothek zu Berlin – Preussischer Kulturbesitz). It is now known that this brown pigment is formed during the digestion of haemoglobin and produced by the malaria parasite through biocrystallization . The presence of brown pigment (also called haemozoin) in organs at autopsy is a strong indicator of malarial infection. In the early years of microscopy, staining technology was in its infancy. The French army doctor, Laveran, had to use unfixed and unstained blood for his experiments, and could see in the blood of his patients a dark pigment that was, according to Virchow, the result of infection with malaria. Some years passed before Malachowski developed a stain which allowed for differential identification of blood parasites . Laveran agreed with Meckel with regard to the brown pigment, maintaining that the pigment was chemically related to melanin: “Melan æmia is specially very pronounced in individuals who died from acute paludisme (pernicious attacks); the colour which it gives to certain organs, particularly to the spleen, the liver, and the grey substance of the brain, is almost always sufficient to show from microscopic examination if death is the result of paludisme”. More convincing was his observation of male gametocytes undergoing exflagellation (Figure 5). 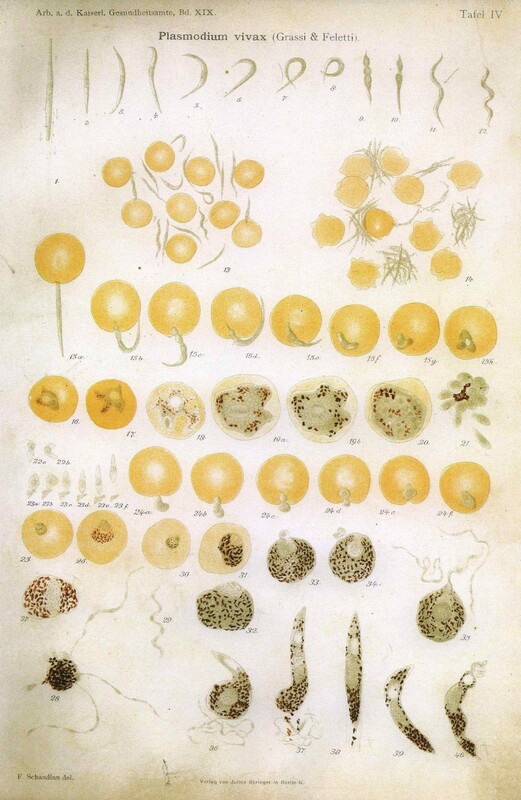 In 1880 at the Military Hospital at Constantine in Algeria he discovered, on the edges of pigmented spherical bodies in the blood of a patient suffering from malaria, filiform elements resembling flagella which were moving very rapidly: “I was still hesitating whether these elements were parasites, when on November 6th, 1880, on examining the pigmented spherical bodies mentioned above, I observed, on the edge of several of these elements, moveable filaments or flagella, whose extremely rapid and varied movements left no doubt as to their nature”. Laveran’s drawing of malaria parasites. The first person to provide definitive proof that mosquitoes carried malaria was British army surgeon, Ronald Ross. Working in Secunderabad, India, under the tutelage of his mentor, Patrick Manson, Ross undertook a meticulous, two-year search, microscopically examining thousands of brindled grey and white mosquitoes fed with malarial blood, looking for a pathogen inside the mosquito. In 1897, he obtained a few mosquitoes which belonged to a species with spotted wings. Ross fed these mosquitoes with blood from a patient named Husein Khan, whose blood contained numerous crescent-shaped cells (Figure 6) . It was in these spotted mosquitoes, now known to be Anopheles species, that Ross detected characteristic pigmented bodies in the stomach wall. Because mosquitoes do not produce pigment (haemozoin), Ross deduced that the pigment was causally related to malaria . 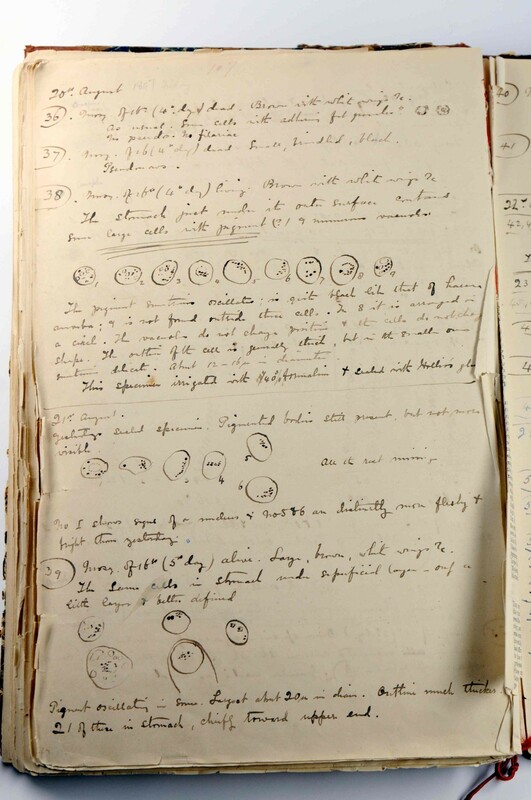 Ross’ Diary and Notes of Researches on Malaria, Book I, page 107. (Courtesy Archives Service, London School of Hygiene & Tropical Medicine). Der Gedanke, dass die Stechmücke in der Ätiologie der Malaria eine wesentliche, möglicherweise die einzige Rolle spielt, kam mir bei meinem ersten Aufenthalt in Indien 1883/84, als ich zum ersten Mal die Verhältnisse, unter denen die tropische Malaria gedeiht, und exquisite Malariagegende kennen lernte. Seitdem habe ich mich immer in diesem Sinn, namentlich auch in meinen Vorträgen und Kursen, ausgesprochen. Selbst veröffentlicht habe ich bis vor kurzem darüber nichts, aber R. Pfeiffer erwähnt es in seinem: Beiträge zur Protozoenforschung Berlin 1892, S. 22. The idea that mosquitoes play an important, possiblythe only part in the aetiology of malaria, came to meduring my first sojourn in India in 1883/84, when forthe first time I came to know the conditions underwhich tropical malaria flourishes and came to knowexquisite malarious regions. Since then, I have alwaysexpressed this view, especially in my lectures andcourses. Until recently I have not published anythingabout this subject, but R. Pfeiffer mentions it in his: Beiträge zur Protozoenforschung, Berlin, 1892, S. 22. Letter from R Koch to G Nuttall. Giovanni Battista Grassi, an Italian zoologist, scientifically distinguished different species of mosquitoes. In 1898, he unequivocally identified Anopheles claviger (syn A. maculipennis) (Greek anofelís: good-for-nothing) as the sole vector of malaria in Italy . Patrick Manson, a Scottish physician, realized that the exflagellation described by Laveran could not take place within the bloodstream, but only when the parasite was outside of the human body, exposed to moisture and a lower temperature, such as within the stomach of some insects. Manson’s malaria theory consisted of two parts: the metamorphosis of the “flagella” occurs in the mosquito’s stomach and the liberated flagella enters drinking water. The second part of his theory – which stated that drinking contaminated water was the reason for getting malaria – turned out to be completely wrong . In 1900, Manson provided convincing, if disturbing, experimental proof of the role played by mosquitoes in the propagation of malarial fevers. On 29 September, Manson reported a positive infection experiment using Anopheles mosquitoes imported from Rome. The journey from Rome to London lasted about three and a half days, and most of the mosquitoes arrived in London alive and in good condition. The insects were permitted to bite the fingers and hands of Manson’s healthy, 23-year-old son, Patrick Thurburn Manson, who had never suffered from malaria, and who had not been abroad since the age of three. He passed through a sharp attack of double benign tertian fever malaria about 14 days later. Quinine was administered and the young Manson soon returned to good health . Principally: protection from mosquito bites. 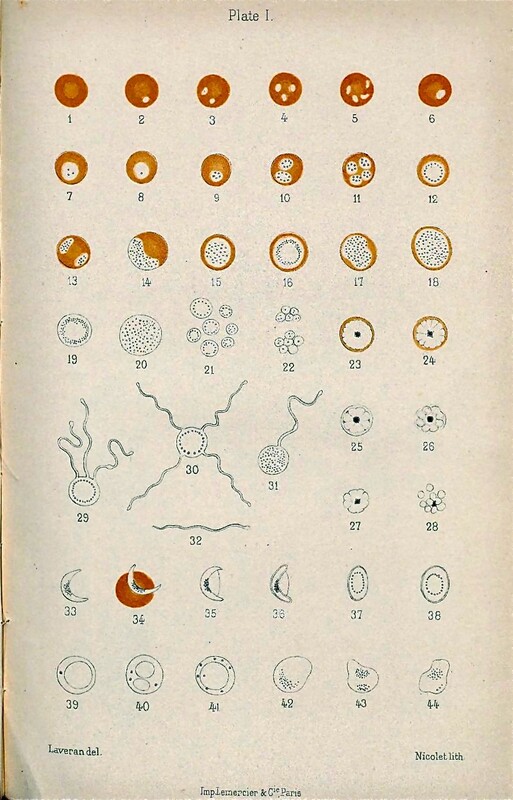 Between 1885 and 1892, Bartolomeo Camillo Golgi studied the asexual cycle of the malaria parasite and related its stages to the observed stages of the various forms of malaria (Figure 8). He found that the febrile bouts coincided with segmentation (“Golgi’s law”). His work was the first to demonstrate the concept of a biological clock. Golgi’s original microphotograph of a daisy-like malaria blood preparation. (Courtesy Museum for the History of the University of Pavia). In studying the relationship between the biological cycle of the malarial parasite and the onset of fever, Golgi found that the two types of intermittent malarial fevers (tertian, occurring every other day, and quartan, occurring every third day) were caused by different species of Plasmodium and that the paroxysms of fever coincided with the rupture and release of merozoites into the bloodstream . In 1903, Fritz Schaudinn reported that the female Anopheles mosquito injected sporozoites into the bloodstream, after which the sporozoites directly entered red blood cells. Schaudinn had been struggling for some time to solve the mystery of the mode of entrance into the body by malaria parasites. From 1901–1904, he worked at the malaria station in Rovigno, a small town in Dalmatia (now Rovinj, Croatia), which was notorious for its high rate of malarial infection. He performed a set of five experiments in which he allowed mosquitoes to feed on his maid, who had Plasmodium vivax crescents in her blood, and subsequently used his own blood for invasion experiments. In the first four experiments, he failed to find any evidence of direct red cell invasion. In the last experiment, however, he observed the malarial sporozoite (the end-stage form in the sexual cycle of the parasite) directly entering a red cell. The sporozoites did not develop further within the red cell (Figure 9) . No appropriate controls were used, and the experiment was not replicated. Unfortunately, Schaudinn died on 22 June, 1906 at the age of 34. Due to his impressive list of accomplishments, Schaudinn’s report of direct penetration of erythrocytes by infective sporozoites of P. vivax dominated scientific opinion until 1947, when Henry Shortt and Cyril Garnham showed that a phase of division in the liver preceded the development of parasites in the blood . Schaudinn’s drawings showing direct entry of erythrocytes by infective sporozoites in cells numbered 15 a–h. (Courtesy Tropeninstitut Hamburg). Malaria remains one of the most important causes of human morbidity and mortality worldwide, with a tremendous impact in the developing world. Theories on the cause and transmission of malaria have evolved over time, from Hippocrates’ theory of bad air in the Fifth Century BCE to our current understanding of Plasmodial organisms as the causative agent of the disease. Treatments for malaria have likewise changed over time, from Sammonicus’ magical amulets in the Third Century CE to today’s anti-malarial drugs. Current anti-malarial treatments are much more sophisticated than ancient therapies. However, as some of the drugs in the anti-malarial arsenal are losing effectiveness, perhaps over time there may be a resurgence of bygone therapies. Both authors contributed to the research, drafting and editing of the paper. Both authors read and approved the final manuscript.